I have been on the hunt for the perfect kitchen curtains for our little nook for quite some time. I wanted something sheer, light and airy, yet pastoral and minimal to fit in with our aesthetic. I didn’t want to go the route of gingham or flowered lace or plain old white, something warmer and more neutral given that I like to change up the table cloth just about every other week. After many months of searching the internet I came up with nothin’, so I decided to rig something up from an idea I saw a few weeks back in an IKEA catalogue (of all places!) and make curtains of my own. And wouldn’t you know it, I don’t know how to sew! Learning how to sew is on my list of “things to learn” but until then, this method worked really well and took me about thirty minutes from start to finish. You can’t beat that. 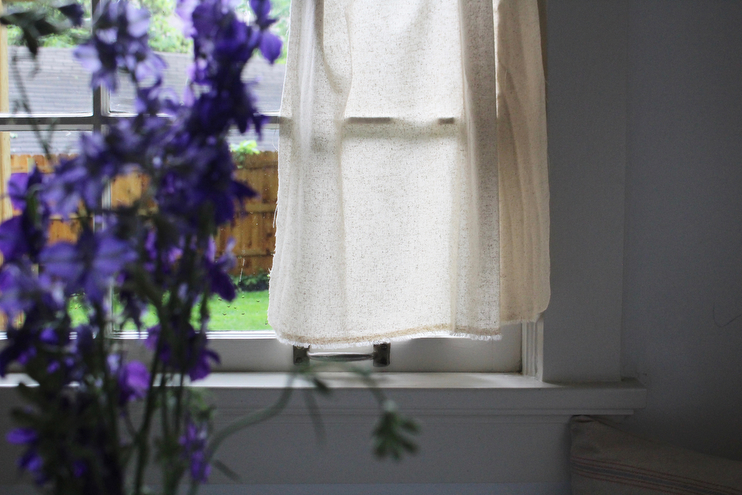 The fabric I chose lets in the perfect amount of light and adds so much charm to this already cozy space. Project by project, I am basically turning our home in to a cottage…a minimal cottage to suit Andrew’s tastes as well because he’s the one that stresses simple interiors over here. Me with my vintage knick-knacks all over the place not so much! Fabric: I used an oatmeal cotton/linen blend found at the craft store. And you’ll never believe it but these two pieces are scraps from a table cloth I made a few weeks back! I didn’t have to adjust them one bit, only a cut down the center to make two curtains, so obviously this fabric was meant to hang here. I love it when things like this happen and catch me off guard. Sharp scissors: I got mine here. You get three pairs for a great price. Jute or heavy string: Again, you can find these at the craft store. Nails or something to attach the jute to the window: probably in your junk drawer if you’re like me, but the hardware store will have them too. 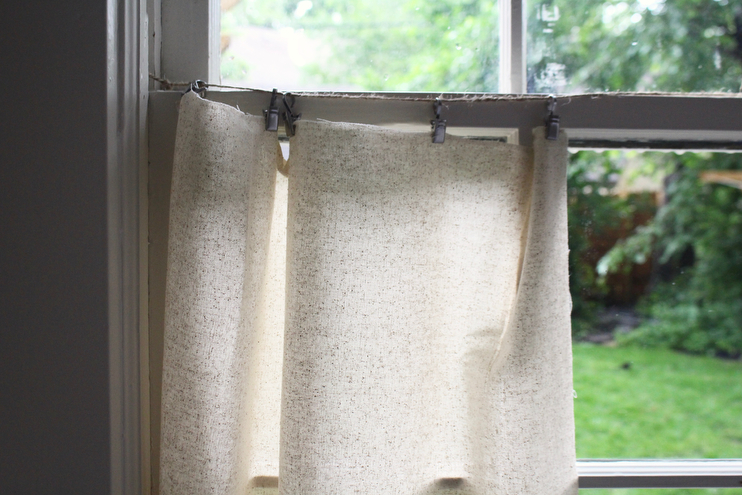 To make, measure out the piece of fabric you’ll want to cover your window. I opted to cover half of our kitchen window to let more light in, but you could go the whole length or even just do the top half. You’ll want to make sure the length is good from the string to the bottom part of the window to make sure you are getting good coverage. Next, put one nail in the top of the window frame on each side in the corner. If you’re not wanting to nail into the wood, I am sure you could find something like an adhesive hook in place of something more sturdy like a nail. Then tie your jute from one end of the nail to the other, making sure it is very taught. I did a few knots to keep everything just so. If you have selected heavy fabric you may experience some sagging, thus I would purchase something light and airy if you happen to come across that. To finish up the project, take your clips and attach them to the fabric. I used five clips per sheet, so ten in all. I also put a very thin nail in the top of the window frame in the middle to hook the center part of the jute string to help with the sagging. And that’s it, a simple way to add cottage charm on a dime. Aren’t they the sweetest?! 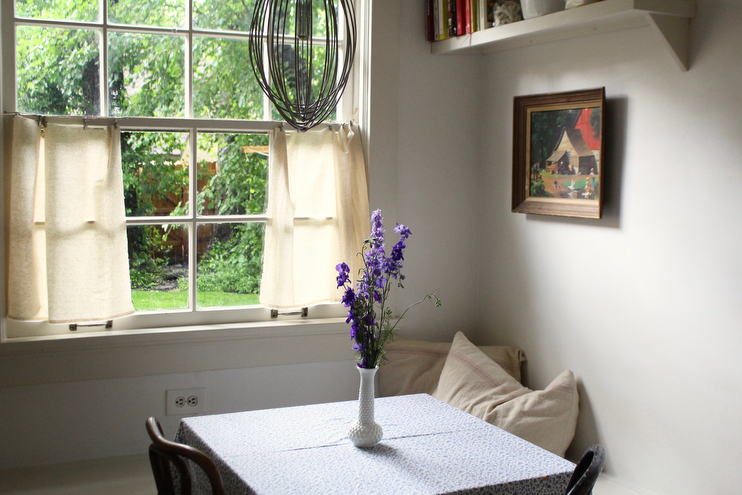 Perfect…Love how their simplicity adds so much charm to this corner.